One handed keyboard for one hand typing (compact, ergonomic, wireless). If you’re looking for a one handed keyboard then we firmly believe that our wireless keyboard products offer many beneficial features to those who for whatever reason use only one hand when typing. Besides able-bodied users, we are happy to see more of our keyboard sales going to a range of users with movement impairments. These would include for example users with carpal tunnel injuries, stroke victims, Parkinson’s and Cerebral Palsy. Our keyboards can be easily operated using either one or both hands. One of the main benefits on offer is the ease with which you can quickly learn and begin to use them productively. This is also the main advantage our keyboards have over dedicated one handed keyboards, which in practice are not that easy to learn or use. if you happen to be recovering from a hand injury then you can also look forward to being able to use both hands for typing on our keyboards when fully recovered. Feedback from our current customers has been extremely positive with many of them buying two keyboards (mostly Optimized) for home and work use. Bear in mind that if a one handed user can benefit so much from using our keyboards then it stands to reason that a two handed user can do even more so. You’ll find that our competitor keyboards are considerably more expensive. Most if not all of these competitor keyboards are priced in the hundreds of dollars (USD). For example, the one-handed Maltron will set you back approximately $420 along with additional tax(es) for certain territories and extra again (likely) for post & packaging. Others range in price anywhere from approximately $250 to $650. BeeRaider’s keyboard prices are all-included-prices with express delivery (within a week of order) by DHL. Our current wireless keyboard products are available in two layouts, Optimized and QWERTY and are intended for use with desktop PCs running Windows operating systems: 7.0, 8.0/8.1 and 10.0. So if you want to increase your work productivity by typing faster while using only one hand then our one handed keyboard is definitely for you. Consider for example that you won’t ever have to hold the Shift-key again while simultaneously pressing a combination character; this is because we’ve introduced the concept of sticky-keys to our keyboard hardware. All keys on our one handed keyboard marked with a dot are sticky in operation. Along with the central space-key you’ll find a second space-key at the bottom-center of our keyboards. Arranged either side of this are the green and blue dotted keys. Both of these dotted keys operate in Sticky mode, which again means that you don’t have to hold them down while simultaneously selecting a combination character. Just press them momentarily before pressing a combination character. These two keys are used when selecting their corresponding coloured characters. Users should also take note of the two Shift keys located below the central Space key. The Shift key on the left operates in standard fashion while the one on the right with the white dot operates in Sticky mode. The user can decide which one best suits their needs at any given time. The innovative use of these dotted keys improves operational speed and together with the compact nature of the design means that the keyboard can be easily operated with one hand. The compact ergonomic shape of our large-key one handed keyboard also helps prevent repetitive strain injuries (RSI). Note that the bottom three keys are intended to be operated by the thumbs if typing with both hands. So how do you type when typing with one-hand? Our recommendation below is one general suggestion. Different users may have their own preferred variation on this suggestion and that’s fine as long as the user is effective and comfortable when typing. Use the thumb to operate the bottom space-key and the green and blue dotted keys. Having memorized the layout of the alpha-characters on the Optimised keyboard, the user is ready to start typing. Begin by aiming for accuracy and letting the speed come naturally as the muscle-memory of the fingers starts to kick-in over the first few days. We are partnered with DHL who provide express delivery worldwide, usually within a week of order placement. Your credit-card order placement is protected at all stages by our use of the SSL industry security standard. You can verify this by noticing the presence of the SSL green-lock icon in the address-bar window of your browser. Note: Owing to Customs restrictions we no longer deliver to Brazil or India. Note: USB nano-receiver, Mini Driver-CDROM and User Guide also come with the above. The layout of the characters on our Optimized one handed keyboard is in keeping with the frequency of occurrence of the characters in the English alphabet. They have been arranged in the layout so that the most frequently occurring characters fall most readily to the two most agile fingers of the hand, namely the index and middle fingers. This alpha-character layout can also be easily memorized in about 10-20 minutes. Designed as a logical character layout, it helps improve the overall efficiency of user data-entry by minimizing finger-travel-time. All these unique features combined help to increase the speed of user data-entry leading to increased productivity. Our Training web-page contains material that will quickly help you to come to grips with our Optimized Keyboard. overlay with Optimized layout come with the above. Our QWERTY keyboard is both compact and ergonomic, characteristics it shares with our Optimized keyboard. However, it does not have the designed logical layout and efficiency of our Optimized keyboard. 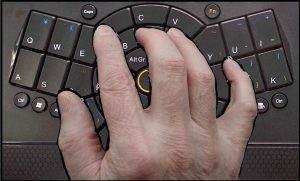 In the sections that follow we look more closely at the many benefits of our keyboards when used as either a one-handed or two-handed keyboard for data-entry. Both our Optimized and QWERTY keyboards are programmable. You can automate the execution of a sequence of frequently used commands in any application. So for example, you could do this in your spreadsheet application by using the macro-record program that comes with our keyboards. This is a great way to take the tedium out of oft repeated tasks when using an application. Just use the macro-record feature to record the command-key-sequences and then name-save the macro(s) for future loading with whatever applications you intend to use them with. Because you have 5 programmable keys on your one handed keyboard, you can (at any given time) assign a different (application specific) macro to each of these 5 keys for use with your current application. The main-key-cluster has a much smaller footprint compared to that of a standard QWERTY keyboard. The following graphic shows the comparative difference, which amounts to a footprint space saving of approximately 33%. This space saving reduction is achieved without sacrificing key-cap-size; in fact many of the key-caps are much larger while the smallest key-caps are equivalent in size to those found on the standard QWERTY keyboard. The Optimized keyboard has been expressly designed to be logical and efficient in use, facilitating increased user productivity, it has been specifically designed to minimize finger-travel-time. The layout of the alphabet characters are positioned in accordance with their frequency of occurrence in the English language, so that they fall more readily for use by the more agile index and middle fingers. This greatly reduces the amount of finger-travel-time thereby increasing your speed of data-entry. The location of the alphabet keys on each keyboard is relatively easy to memorize but more so with the Optimized keyboard, whose alphabet keys layout can be memorized using our training material in only 10-20 minutes. If you stop to think about it, almost everyone who uses a standard QWERTY keyboard would not be able to tell you where all the alphabet keys are located on it. Even people who have been using the standard QWERTY keyboard for many years are unable to do so. The reality is, it’s not a very logically designed keyboard and as a result it isn’t very efficient to use. When using the Optimized keyboard and while following BeeRaider’s recommended learning approach, a user’s finger-muscle-memory kicks in after only a few days of continuous typing. With the alphabet key locations memorized and finger-muscle-memory now in place, a user’s typing speed and productivity quickly increases. Note that we provide a comprehensive training method and video on our Training webpage for those who decide to purchase our Optimized keyboard. Note that Babbage is a leading company in its field providing technology and training that makes information accessible to people with physical and visual impairments. Babbage is now promoting BeeRaider’s Optimized keyboard as its only recommended keyboard for one handed users. Click here to download and print off the Full-sized Optimized Layout for hand-size checking. Click here to download and print off the Full-sized QWERTY Layout for hand-size checking. Our one handed keyboard is known as a Radial Keyboard Design. It has been designed as a 21st century computer keyboard with none of the shortcomings of the QWERTY standard keyboard, a design that was contrived for use with the mechanical typewriters of the late 19th century. The Radial Keyboard design is about simplifying the future of data-entry!